Men in Black 3 goes back in time when it rockets into theaters at midnight. The Barry Sonnenfeld-directed flick is a fantastic third film in the trilogy (check out our review later today). Countless film series have attempted to close out their trilogies with a piece of work that inspires and enthralls, yet few succeed. So... who rocks it? Movie Fanatic proudly presents our Top 10 Movie Trilogies: Top Third Films. Which third film in a trilogy managed to prove that three times is indeed a cinematic charm? Legions adore the first film. A surprising number appreciate the second. But for us, the culmination of the trilogy that is Back to the Future is handled impeccably in Back to the Future 3. Among our qualifications of a solid third film in a trilogy is the work’s ability to stand alone as a solid story. Marty McFly, as embodied by Michael J. 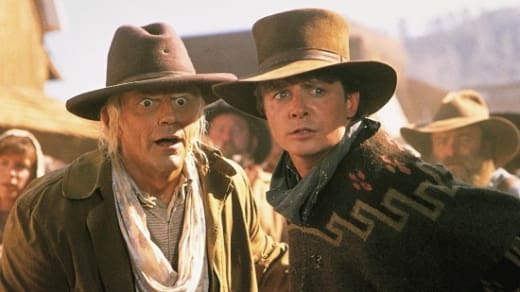 Fox, and Doc (Christopher Lloyd) have an unspoken bond by film three. The result is a Western-meets-sci-fi triumph that allowed both stars to soar and bring the franchise to a solid conclusion. Oren Peli’s third go-around at his found footage of things that go bump in the night takes us back to the beginning. It is a solid plot move for a series that seems to have gone through its story arc effectively in the first two films. Not only by heading back to the 1980s and giving the audience the refreshing feel of the early days of home video -- and thus the "found" footage aspect of Paranormal Activity 3 -- can the series' filmmakers draft new scary stories, but also take an invested fan group to the origins of a tale they have treasured. As Eastwood achieved in the Dollars trilogy, Matt Damon mirrors in his sizzling performance as Jason Bourne over Paul Greengrass’ trilogy. As his Bourne learns more and more about who he truly is, the power of Damon’s acting chops is put on full display. The third flick stands with the first two in this earth-shaking action series, but pushes the envelope by coming to a conclusion that is both satisfying and salacious in its ability to have us wanting more. Just as Barry Sonnenfeld achieves with Men in Black 3, the third Ocean's movie is leagues better than Steven Soderbergh's second, Ocean's 12. The action is crisper and does what a sequel should do, instead of merely feeling like a third addition. Ocean’s Thirteen recalls the original in so many ways, something audiences want in a series, but also stretches its legs to encompass new ground. In fact, as any film series that employs suspense should do, it enhances everything to a higher level of awesomeness in the third effort. Sergio Leone’s The Good, The Bad and The Ugly sometimes is forgotten as it is a third part of the filmmaker’s Western trilogy. The story is part of his Dollars franchise that began with A Fistful of Dollars and continued with A Few Dollars More. Clint Eastwood essentially made his name in these films and his characterization in Leone’s third film in particular, is riveting and revolutionary. Sonnenfeld directs his third Men in Black film with MIB3 and in the process completely atones for Men in Black 2. That film was cherished by fans, but also placed by many under the category of, “That’s your sequel?” As Men in Black 3 premieres, it will give fans of Sonnenfeld’s series a completely unique take on the franchise by going back in time. Josh Brolin is Tommy Lee Jones through his portrayal of a young Agent K. The plot sizzles. History buffs will appreciate the references to 1969 and the earth-shattering year that it was. And did we mention Will Smith returns to the cinema for the first time in four years? It is truly out of this world. Although not the best of the first (real) George Lucas trilogy, Return of the Jedi is a terrific stand-alone film. Even without seeing Star Wars and Empire Strikes Back, audiences could not only follow Return of the Jedi, but also cull the emotional power from the series that has galvanized generations. We can forgive the Ewoks (I know some of you adore them!) and the singing at the end. That is because within the scope of the Star Wars world, Return of the Jedi gives Lucas’ characters a compelling closing story arc and emotionally satisfying means to an ends. Although the second of the Steven Spielberg Indiana Jones trilogy (yes, we’re forgetting the fourth film even exists) was the weaker of the first two, the filmmaker did what so many have done before and crafted a third film that is a complete triumph. The casting of Sean Connery as Indiana Jones’ father is a stroke of genius. The story of the search for the Holy Grail also possesses the power of the great epics in Hollywood history. Indiana Jones and the Last Crusade also achieves a rarity in film: It is a piece of work that can be viewed a hundred times and never loses its resonance. Oscar thought Peter Jackson’s final of J.R.R. Tolkien’s epic adventure was the best as the film won a million Academy Awards including Best Picture. What was being built during The Fellowship of the Ring and The Two Towers comes to a satisfying and triumphant conclusion that does what so many third in a series tries to do: Has an ending that makes audiences simultaneously smile and wish for more. The “more” in this case will be coming at you this Christmas as Jackson returns to Middle Earth for the Lord of the Rings prequel, The Hobbit. Toy Story 3 not only was a brilliant piece of work and the best of the Pixar series, it was quite possibly the best film of 2010. 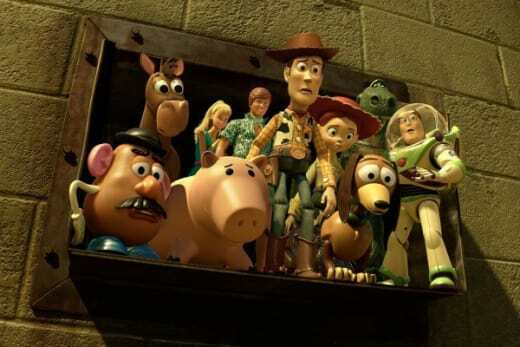 Neither of the first two films possessed the emotional power of Toy Story 3 that resonated with both young and old(er). When filmmakers seek to embark on their own trilogies, they need to look no further than the Toy Story franchise to see how you build to not only a satisfying close, but a third film that brings all that emotional power culled over two films and wraps it up in a bow that brings tears, cheers and has the lasting power that allows audiences to never forget the experience of seeing it.